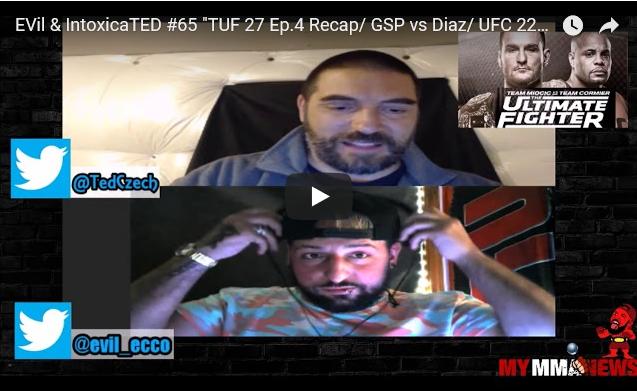 EVil Eddie and Ted Czech are at it again this week directly after TUF 27 goes off air, to recap the nights highs and lows including a rating for this episode. Then a look into this week in MMA news or drama rather, followed by the UFC 224 predictions. UFC 224 is headlined by a women’s bantamweight title bout between champion Amanda Nunes and challenger Raquel Pennington. EVil Eddie and Ted Czech are at it again this week directly after TUF 27 goes off air, to recap the nights highs and lows including a rating for this episode. Then a look into this week in MMA News or Drama rather. Diaz vs GSP is discussed followed by the UFC 224 with Predictions. Catch more from Pure EVil MMA Podcast on MyMMANews here. Previous Joe Giannetti Of TUF 27 Talks About Making TUF History With Quickest Submission EVER!